I purchased this for my daughter,I was a little concerned because some reviews said it was cheap ,but I was thrilled with my purchase it is as stated in the description printed on acrylic ,it is light weight,but stunning on the wall.My daughter was thrilled it added so much to her living room.I gave it four stars because I felt it was a little over priced,but I would recommend this product. 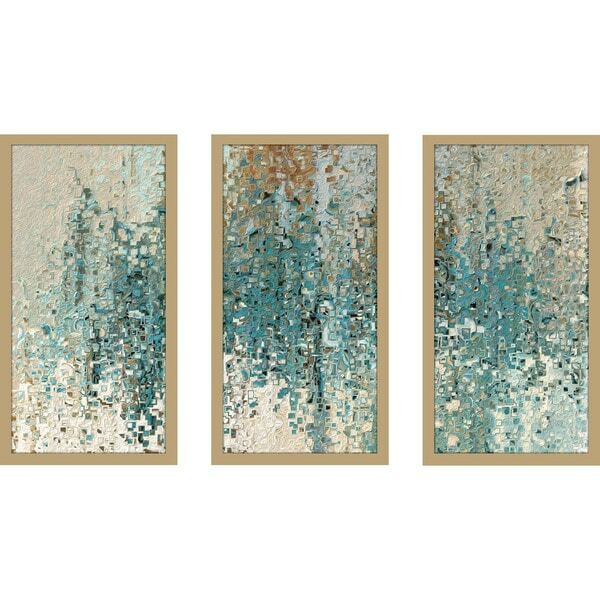 This Wall Art Set of 3 is printed on Plexiglass using a high-speed flatbed printer Producing excellent print quality with a 6-color plus white UV-curable inkjet system The breathtaking effect of fine art printed directly onto Acrylic is unique and exquisite Its reflective vibrant colors creates a contemporary style of art that will bring depth to your walls The artwork has been reprinted from the Artists' original piece with written permission Made in North America & Arrives ready-to-hang Frame: 1" Champagne This framed art print is being custom built for you. Please allow 10 business days for the product to leave our warehouse. This piece is great for the value. It added so much class to my room. "What colors are in the painting?" Teal, Beige, Gray. I hope it helps.